The Digital Deluxe Edition adds the PARADISE ISLAND DLC which includes the lush Phi Phi Island map, an additional sunset weather, and two amphibious fighter aircraft -- the Japanese A6M2-N "Rufe" and the US Navy “Seahawk” SC-1, both with cockpits. 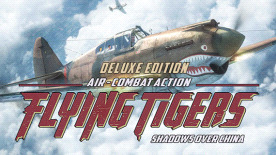 Moreover, the Digital Deluxe Edition also gets you the FLYING TIGERS: SHADOWS OVER CHINA OFFICIAL SOUNDTRACK featuring main-themes "HOPE IS VICTORY" and "FOR THE REPUBLIC", and Norman Wayne's popular country-rock single/EP "THESE GUNS". No micro-transactions or F2P-elements -- for a single purchase, you’ll get the full, stand-alone experience -- with unrestricted multiplayer! © 2015 Ace Maddox AB. The Ace Maddox, Flying Tigers, and Air-Combat Action logos are trademarks or registered trademarks of Ace Maddox AB in the EU, US and/or other countries. Any references to aircraft, manufacturers, and/or builds thereof is for historical accuracy only, and shall not be construed as indicating any sponsorship nor endorsement. Aircraft designs are reproduced in good faith to replicate corresponding World War II era counterparts under artistic, dramatic and historical license.